West Virginia middle school students who are taking part in a three-day aviation camp saw a demonstration of radio-controlled airplanes and took part in a space mission today at the Challenger Learning Center. The 50 students attend 16 Morgantown-area middle school students. Their camp kicked off Thursday at West Virginia University with a visit from Jon McBride, a former astronaut and a West Virginia native. At the Challenger Learning Center the students took part in the two-hour Return to the Moon mission. They assumed the role of astronauts and mission control specialists on this exciting voyage, becoming the first to return to the lunar surface and establish a base camp. 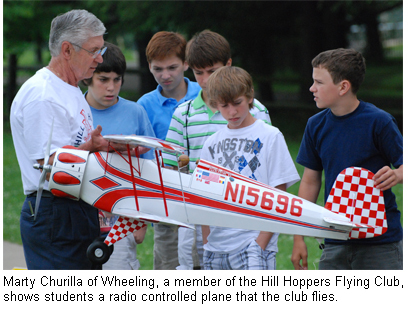 In addition, members of Wheeling's Hill Hoppers Flying Club demonstrated their radio-controlled airpower and talked to the students about flying. On Saturday the students will travel to the Morgantown Municipal Airport for an aviation day event that includes tours of the air traffic control tower, basic flight school classes, mini C-130 rides, and the chance to see aircraft up close and personal. About 500 people are expected at that event. The camp is sponsored by the Mid-Atlantic Aerospace Complex in Bridgeport. Challenger will host a number of summer day camps for children entering grades 4-7. Return to the Moon will run June 23 and June 29, and Voyage to the Moon will run July 15 and July 28 and Aug. 5 and Aug. 7. Children entering grades 1-3 can take part in Explore the World and Beyond on June 30, July 30, or Aug. 6. Visit the website to learn more and sign up, or call 304-243-8740.